Quantum is the world’s most advanced electric space heater. It uses low-cost, off-peak energy, making it the most economical electric heating system on the market today. Plus, it adapts to match lifestyle and climate conditions, delivering heat only when it's needed. With its compact, state-of-the-art design, Quantum is the perfect upgrade for static storage heaters and suits a wide range of applications. A simple to use, backlit LCD controller allows for the accurate selection of room temperature, along with pre-set and user adjustable timing programmes to maximise comfort and minimise running costs. Quantum is up to 27% cheaper to run and uses 22% less energy than comparable static storage heaters, plus it has an advanced easy-to-use electronic control. 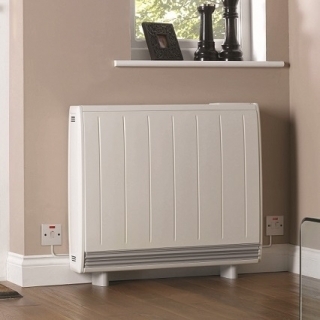 Quantum is also up to 47% cheaper to run than an electric convector or radiator system. Quantum is fitted with our revolutionary iQ controller^ so you can pre-set your heating requirements – just like central heating. Manual adjustment is also simple via its easy-to-read LCD display and user-friendly low torque rotary knob, designed with the visually impaired in mind. Exceptional levels of insulation mean that Quantum will store energy up during periods of low demand, turning it into efficient heat only when you need it. Through its use of a sophisticated self-learning algorithm, the iQ controller is able to take just the right amount of heat to match your lifestyle and the changing climate conditions, intuitively and precisely. As a sign of commitment to quality, each Quantum heater is guaranteed for 10 years.